Fresh milk is an example of a colloid, consisting of fat and protein particles floating in a water-based solution. 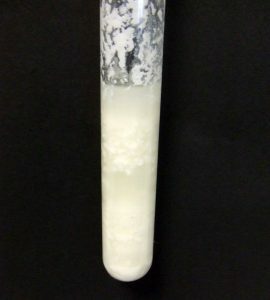 The colloidal suspension scatters light, causing milk to appear white. The protein molecules, mainly casein, repel each other so they naturally distribute evenly through the liquid. Milk is slightly acidic. When the pH is lowered even more by the addition of another acidic ingredient, the protein molecules stop repelling each other. This allows them to stick together or coagulate into the clumps known as curds. The watery liquid that remains is called whey. When milk goes “off” or turns sour, it is because acids produced by bacteria lower the pH of milk so the proteins can clump together. The increased acidity of the milk also causes it to taste sour. The bacteria living in milk naturally produce lactic acid as they digest lactose so they can grow and reproduce. This occurs whether milk is fresh or pasteurized. You won’t notice the effect on flavor until enough acid has been produced. Refrigerating milk slows the growth of bacteria. Similarly, warm milk helps bacteria thrive and also increases the rate of the clumping reaction. If you enjoy milk in your coffee or tea, you may have noticed sometimes milk immediately curdles when added to the hot beverage. Except for the chunkiness, the drink may taste perfectly fine. This is because coffee and tea contain just enough acidity to tip the pH of milk to the point of curdling. The effect is most often seen in milk that is close to going sour or when adding milk to very hot coffee or tea, since the high temperature can coagulate casein. No one wants to drink chunky milk straight from the fridge, but the chemical reaction that causes curdling isn’t always bad. The same reaction produces buttermilk, cheese, and yogurt. Adding lemon juice or vinegar to fresh milk is an easy way to make homemade buttermilk. Why isn’t buttermilk clumpy? It would be, if you added the acidic ingredient to hot milk. However, adding acid to cold milk allows casein to coagulate more slowly. Rather than forming clumps, the chemical reaction simply thickens the liquid. The ingredient also affects the flavor of the buttermilk, adding a tangy note. Yogurt and cheese are slightly more complicated because you usually control the type of bacteria (the bacterial culture) used to make a product with a pleasing flavor and texture. However, fresh cheeses, such as ricotta, is very simply made by heating milk, adding an acidic ingredient, and straining the curd.